Parapharyngeal space (PPS) tumors are rare constituting 0.5% of all head and neck tumors. Salivary gland tumors are common followed by neurogenic tumors. The initial diagnostic modality for these tumors is incisional biopsy which is hazardous at this site. Now, fine-needle aspiration cytology (FNAC) is gaining popularity as a prime diagnostic modality for parapharyngeal lesions. Here, we report a case of schwannoma of PPS in a 32-year-young lady, diagnosed by FNAC. Tumors of parapharyngeal space (PPS) are unusual and constitute 0.5% of all head and neck tumors. Salivary gland tumors are most common followed by neurogenic tumors., Fine-needle aspiration cytology (FNAC) forms the initial diagnostic modality for lymph node, breast, soft tissue, and thyroid lesions, and the technique is well accepted by both a clinician and a pathologist. With the invent of guided aspiration now, FNAC has become the prime diagnostic modality for deep-seated visceral organs too. However, due to inaccessibility, this technique is not popular for pharyngeal and parapharnyngeal lesions and even few authors reported it as inconclusive at this site., Here, we report a case of PPS schwannoma which was diagnosed by FNAC. A 32-year- young lady, presented to the Otorhinolaryngology Department with a history of difficulty in swallowing for 3 months, occasionally associated with hoarseness of voice and pain during swallowing. Past and family histories were not significant. She is not a known case of diabetic or hypertensive. On general physical examination, there was mild fullness in the upper one-third of the left sternocleidomastoid muscle. Oral cavity examination revealed a left parapharyngeal mass measuring 4 cm × 2 cm, firm in consistency. Indirect laryngoscopy was normal. Routine blood and biochemical investigations were within normal limits. Computerized tomography showed a well-defined mass in the left parapharyngeal region with displacement of tonsil medially [Figure 1]a and [Figure 1]b. With the above features, a diagnosis of left parapharyngeal mass was made. FNAC was performed through transoral route, first aspiration yielded only hemorrhagic material, and the report was inconclusive. Repeat FNAC was performed and smears prepared from the material showed moderate cellularity consisting of spindle cells of benign nature with wavy nuclei in the background of myxoid and hemorrhagic material [Figure 1]c. A cytological diagnosis of benign spindle cell tumor possibly peripheral nerve sheath was offered. The lesion was excised through transcervical approach and tissue was subjected for histopathological examination. Grossly, it was a well-circumscribed, capsulated lesion measuring 3.5 cm × 3 cm × 1 cm. The cut section showed gray-white and myxoid areas. Microscopically, the lesion consisted of benign spindle cells with wavy nuclei with hypercellular (Antoni A) and hypocellular (Antoni B) areas. Hypercellular areas showed nuclear palisading, while hypocellular areas showed myxoid change [Figure 1]d. The blood vessels were thickened. With the above features, a pathological diagnosis of peripheral nerve sheath tumor schwannoma was made. Schwannoma is a benign encapsulated tumor of neural origin. These tumors were first described by Verrocay in 1908. These tumors arise from Schwann cells which in turn derived from neural crest cells of neuroectodermal origin. They may arise from any peripheral nerve, sympathetic chains, or cranial nerves (except olfactory and optic nerve). 45%–60% of schwannoma is confined to head and neck region. Controversy exists in the literature regarding the usefulness of FNAC in the parapharyngeal lesions. Some authors still consider it as nondiagnostic. Mondal et al. in their article published in 1993 documented the usefulness of this technique with diagnostic accuracy of 90.2%; however, the technique has not gained popularity. Chatterjee et al. in their study on 67 parapharyngeal tumors observed 35 benign and 32 malignant tumors. The diagnostic accuracy for FNAC observed by them was 94.3% and 90.3% for benign and malignant tumors, respectively. In another study by Mondal et al. on FNAC of 56 parapharyngeal tumors, they observed sensitivity of 96%, specificity of 99%, and diagnostic accuracy of 98.8%. Schwannoma is fusiform in shape and lies along the course of the nerve. They usually present with dysphagia, hoarseness, and rarely pain. Cytological features reflect the area of aspiration, smears from the Antoni “A” areas show high cellularity, and those from Antoni “B” are hypocellular; they consist of spindle cells of benign nature in a myxoid background. Nuclear palisading forming Verrocay bodies are hallmark and mostly evident if the aspiration is from the Antoni “A” areas. Pleomorphic adenomas (stroma rich) which are the common tumors in PPS form the close differential diagnosis (as observed in our case) and histopathology is confirmative. Schwannomas are encapsulated and they are biphasic tumors containing Antoni “A” and Antoni “B” areas along with Verrocay bodies and thickened blood vessels. Therapeutic approach to PPS includes transoral mainly for prestyloid tumors and transcervical for poststyloid tumors (as performed in our case). Other surgical approaches include transcervical-transparotid, transcervical-transmandibular, and through inframandibular fossa. The common postsurgical complication is Horner's syndrome. Others include cranial nerve palsy, meningitis, and vascular complications. From the observation of our case and on review of literature, we conclude that FNAC can be used as initial diagnostic modality for parapharyngeal tumors like schwannoma. The technique is simple, economical, and valid; however, stroma-rich pleomorphic adenoma should be considered as a differential diagnosis as these tumors constitute the most common lesions at that site. Pang KP, Goh CH, Tan HM. Parapharyngeal space tumours: An 18 year review. J Laryngol Otol 2002;116:170-5. Olsen KD. Tumors and surgery of the parapharyngeal space. Laryngoscope 1994;104:1-28. Orell SR, Strrett GF. Introduction. In: Orell and Strrett's Fine Needle Aspiration Cytology. 5th ed. Noida, India: Elsevier; 2012. p. 2-5. Das DK, Gulati A, Bhatt NC, Mandal AK, Khan VA, Bhambhani S, et al. 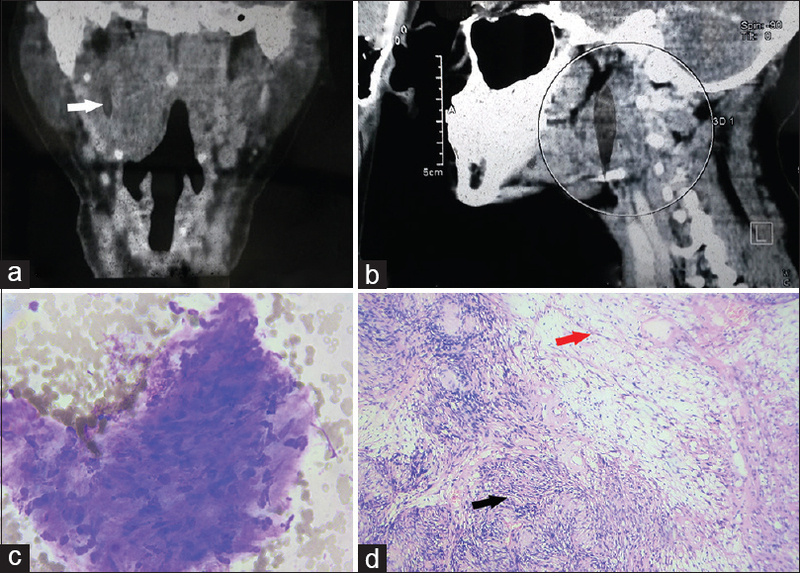 Fine needle aspiration cytology of oral and pharyngeal lesions. A study of 45 cases. Acta Cytol 1993;37:333-42. Chiofalo MG, Longo F, Marone U, Franco R, Petrillo A, Pezzullo L, et al. Cervical vagal schwannoma. A case report. Acta Otorhinolaryngol Ital 2009;29:33-5. Naseeruddin K. Schwannoma of parapharnyngeal space. Int J Head Neck Surg. 2012;3:118-20. Andratschke M, Helmberger R, Mees K. Differential diagnosis of parapharyngeal mass. Laryngorhinootologie 2000;79:174-9. Khandawala PS. Parapharnyngeal tumours. Int J Head Neck Surg 2011;2:95-9. Mondal A, Gupta S. The role of peroral fine needle aspiration cytology (FNAC) in the diagnosis of parapharyngeal lesions – A study of 51 cases. Indian J Pathol Microbiol 1993;36:253-9. Chatterjee DN, Mondal A. Peroral fine needle aspiration cytology of parapharyngeal tumors: A study of 67 cases. Indian J Otolaryngol Head Neck Surg 2009;61:31-4. Mondal P, Basu N, Gupta SS, Bhattacharya N, Mallick MG. Fine needle aspiration cytology of parapharyngeal tumors. J Cytol 2009;26:102-4. Akerman M, Domanski H. Soft tissue. In Orell SR, Strrett GF, editors. Orell and Strrett's Fine Needle Aspiration Cytology. 5th ed. New Delhi, India: Elesiver; 2012. p. 388-409. Bhaker P, Chatterjee D, Gochhait D, Radotra BD, Dey P. Schwannoma of the parotid gland: Diagnosis by fine-needle aspiration cytology. J Cytol 2014;31:196-8.